A review I wrote for Art Papers when I lived in Texas, never submitted, then reworked for my blog in 2007. When I blogged I thought I didn't have a photo but belatedly realized it was in their 1995 catalog from the Contemporary Arts Museum, Houston, The Art Guys Think Twice. So here is the review again, with the photo I never had from the Dallas Museum, where I viewed the installation in '91 (the inset photo is as it appears in the book, to show what's otherwise difficult to see on the video monitors). The main concourse of the Dallas Museum of Art ascends in a series of broad, gently sloping ramps, creating spaces reminiscent of airport architecture. Appropriately, that's where the Art Guys placed their installation Jets during the 1991 Dallas Video Festival. Sixteen TV monitors fanned across the ceiling over the ramps, linked by black cables to a neat bank of VCRs on the wall. Each monitor faced down with its back securely bolted to the ceiling--or so we hoped. The screens glowed pale blue, green, or violet, the ambient colors of footage taped from the sky at different times and places, and intermittently roared to life as an airplane passed across the screen. 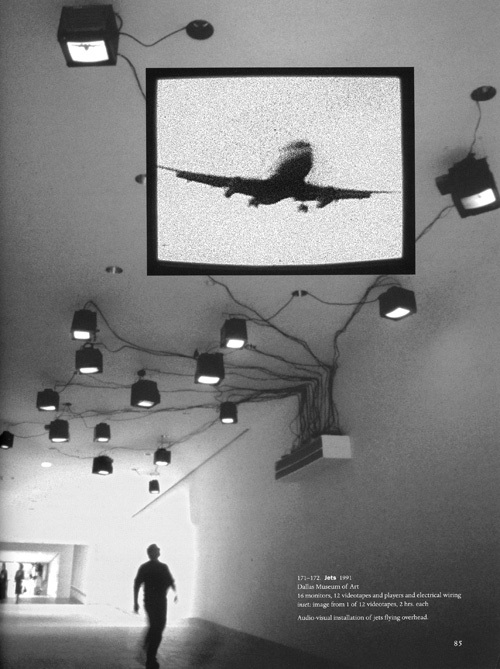 The artists phased the tapes so at a given time some screens showed empty sky and others tracked commercial aircraft landing or taking off in wobbly, hand held fields of view. The random distribution of the zooming images along the corridor kept the viewer off guard: as you followed the progress of one jet, another would loom unexpectedly behind you. The network of cables crawling across the ceiling and down the wall to a controlling ganglion could emblematize the global transportation and communication systems on which we are so dependent, while the fragility of the systems could be felt in the nervous-making Damoclean placement of the monitors. That's one level of interpretation. Yet sitting beneath them for a few minutes revealed something a hurried passerby might have missed: their curious kinship to natural phenomena. The random lightening and darkening of screens and the antiphonal whining of the jets became paradoxically calming, like stars blinking or insects chittering in the breeze. Thus do our daily threats become reassuring background texture. Have written about the Art Guys (Michael Galbreth and Jack Massing) a number of times (recently here).